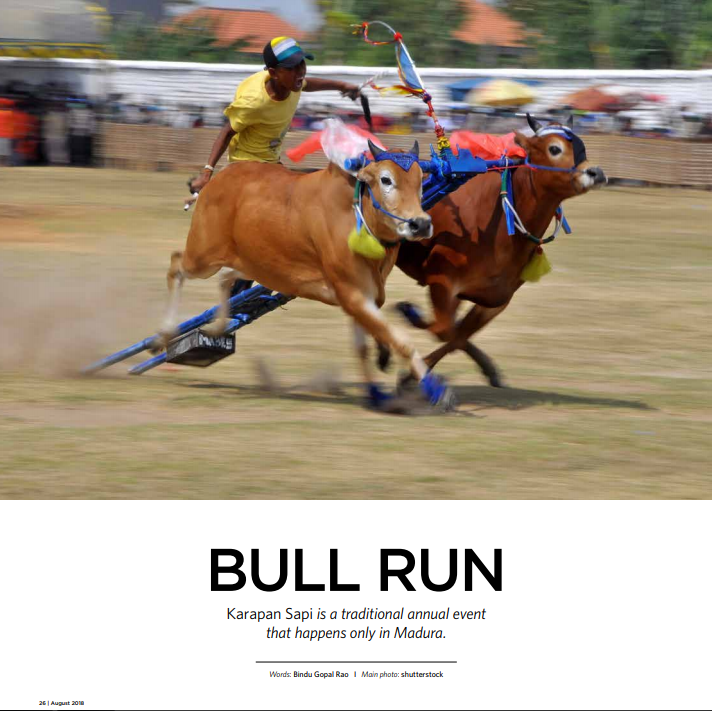 Karapan Sapi is an annual traditional event that happens only in Madura. On a recent visit to Bali, I was lucky to see a one of its kind event called the Karapan Sapi, a bull race that happens in Madura, a small island located across the Madura Strait to the northeast of Java Island known for its scenic beauty. This traditional sport has been around for several centuries and happens at the district level, regency level and finally to the residence level with the finals where the competitors vie for the President Cup in the city of Pamekasan. The race typically happens during the months of July to October. The origins of this race are traced to Sapudi Island in Madura and there are two interesting stories behind its history. One school of thought believes that is that the race was used by Ulema, a Muslim person to spread Islam across Madura and another says this race was created by an important man from Sapudi Island to make the soil fertile by plowing. Prince Kantadur from local kingdom of Sumenep in the 13th century also helped popularize the game and in the 1930’s Dutch rulers did their bit to organize and promote the sport across the East Java Province. Interestingly not all bulls make the cut to qualify to be race ready. It is said that the race bulls are the ones whose chest shape narrows from upper to lower, have humped-necks, short horns and a big strong body with long back, tight nails and a long tail. Their daily diet includes a mix of herbs, honey and eggs which is increased by several notches before a race. And yes, bulls are also given a relaxing massage as well so that they can perform at the top speed! When I arrived at the venue which happens to be a large open field fenced all over, there was a palpable under current of excitement. Rows of chairs had been arranged at one end with a lot of local food – boiled peanuts, sweet potatoes and more. The racing event is evidently popular with locals and is quite a unique experience for tourist’s that makes this a win-win for all. For locals especially this event has prestige value because the bull owner who wins will stand to gain much socially and financially too. 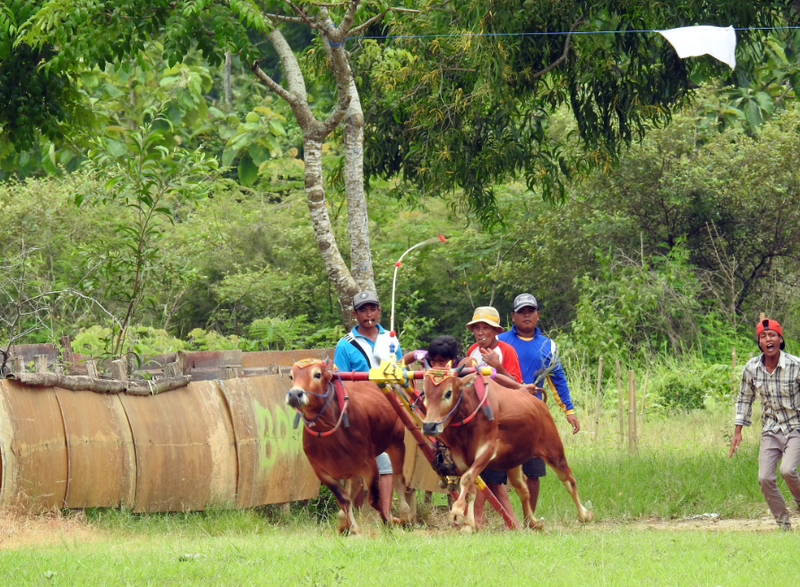 Before the race begins each team parades their bulls to the lilting tunes of Madura’s traditional instrument Saronen and local school children performing the traditional ‘Pecot Dance’ (picot means whip locally). The participating bulls themselves are also given a makeover with rich clothing, flowery ribbons and other decorations as part of the parade. When the race is about to begin, these are removed for more practical gear. 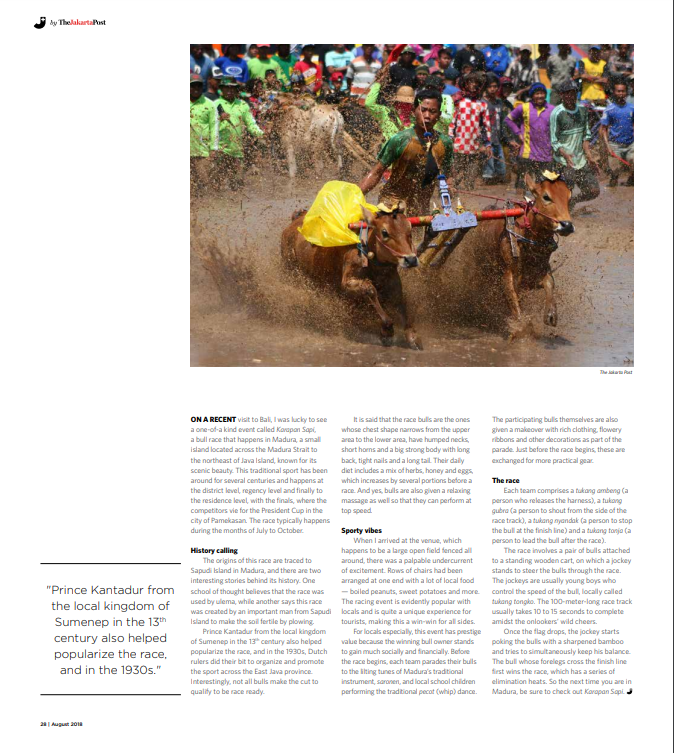 Each team comprises a man who releases the stranglehold called tukang ambeng, a man to gnash the bull or tukang ambeng, a person to shout at the side of the race track called tukang gubra), one to stop the bulls at finish line or tukang nyandak and one to lead the bulls after the race called tukang tonja. The race itself is done with a pair of bulls attached to a standing wooden cart on which a jockey stands to steer the bulls through the race. 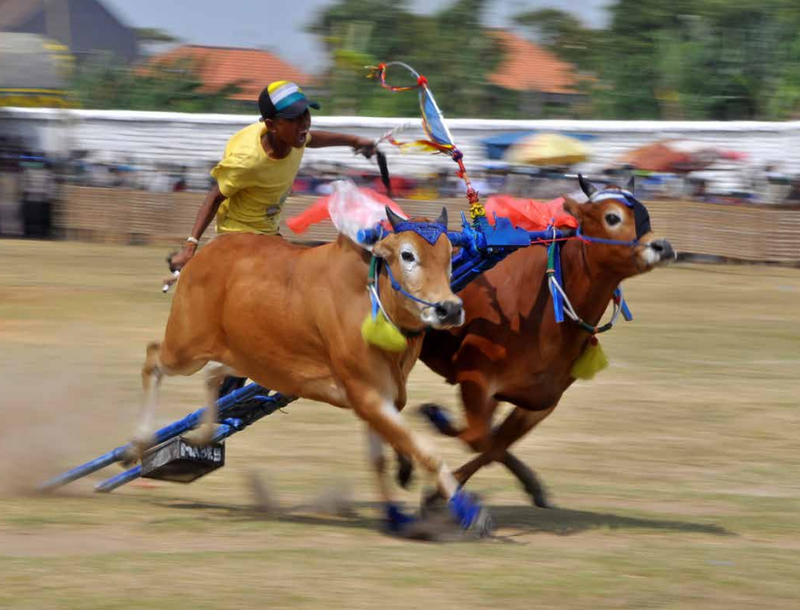 The jockeys are usually young boys, who control the speed of the bull and are called tukang tongko. The 100 meter long race track is covered in 10-15 seconds amidst wild cheering by the onlookers. Once the flag drops, the jockey starts poking the bulls with a sharpened bamboo and tries to simultaneously keep his balance. The bull whose forelegs cross the finish line first wins the race that is has a series of elimination heats. So the next time you are in Madura do check out the Karapan Sapi.